HIALEAH, FL�FEBRUARY 7, 2016�Favored Fire, a graded stakes-placed son to world champion sire Walk Thru Fire, led a slew of qualifiers into the $204,265 South Florida Quarter Horse Derby final on Sunday afternoon at Hialeah Park. The lightly raced 3-year-old defeated Genovese to set the top qualifying mark from 31 starters in four trial races. Eight of the ten qualifiers came from the first trial. The 10 fastest are set to return to the South Florida racetrack on Sunday, February 28 and vie for a winner's check of $85,791 in the 440 yard final during the track's closing weekend. Second in the John Deere Sam Houston Juvenile last May, Favored Fire made his first start this year, under jockey Francisco Ramirez, Jr., in Sundays first trial. The brown colt closed gamely to win by a neck while recording the top time of :21.279 seconds, a 103-speed index with a 17 mph tailwind. Horsemen's representative Ronnie Stewart presents the trial blanked to the winning connections of Favored Fire. Yoani Abreu conditions Favored Fire for owner/breeder Luis Miguel Albores-Gleason. Out of the Teller Cartel mare Favored, the 3-year-old California-bred has compiled a (5) 2-2-0 record and earned $27,402. Genovese, winner of the Ruidoso Juvenile Invitational Stakes last summer, races for owners Denis and Julie Schoenhofer and trainer Kalah Welch. The royally bred son of Mr Jess Perry ran willingly under jockey Omar Reyes, just missing but setting the second fastest time of :21.279 seconds, also a 103 speed index. Entrust RT Services Inc./FBO Tiffin bred Genovese in Texas from the champion First Down Dash mare Tiny First Effort. The sorrel has earned $34,220. Hialeah Derby winner Ec Jet One got his third consecutive win of the Hialeah meet in the final trial while defeatimng Sprinster by three-quarters. Jockey Rodrigo Vallejo rode the colt, by leading second crop sire The Louisiana Cartel, to the second fastest time of :21.414 seconds, a 99 speed index into an 11 mph crosswind. Leading trainer Judd Kearl conditions the bay colt for owner/breeder Enrique Carrion. Out of the Mr Jess Perry mare Pretty Girl Perry, Ec Jet One's record stands at (7) 5-0-1 with earnings of $292,369. For the complete list of South Florida Quarter Horse Derby finalists, times, sires, dams, owners, breeders, trainers and jockeys CLICK HERE. The second 10 fastest qualifiers from today's trials will be preferred invites for the $25,000 South Florida Quarter Horse Stakes Invitational to be run at 440 yards on Saturday, February 27. CLICK HERE for a list of those 10 horses. 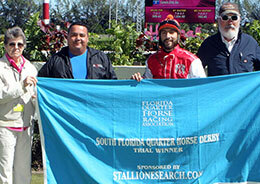 Favored Fire Sets Fastest Time For South Florida Quarter Horse Derby - See more at: http://stallionesearch.com/default.asp?section=6&area=4&story=18842#sthash.XoI3IZU8.dpufHIALEAH, FL�FEBRUARY 7, 2016�Favored Fire, a graded stakes-placed son to world champion sire Walk Thru Fire, led a slew of qualifiers into the $204,265 South Florida Quarter Horse Derby final on Sunday afternoon at Hialeah Park.